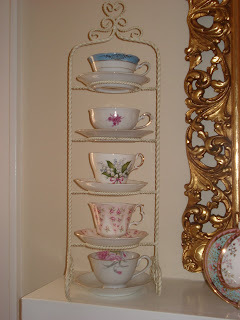 These are a few more vintage teacups in my collection. I took these photos a few weeks ago. 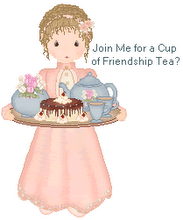 Thanks to Gracious Hospitality's challenge of "Teacup-a-Story" I see them as more than a grouping of pretty teacups. Each one has a story. Two were gifts from a dear friend, one was my mother's, one was my Aunt Mary's and the others were Aunt Ida's. I will never know the details of how, where or why my aunts and mom acquired these particular teacups. 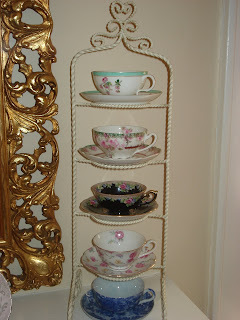 But, I do know this, these teacups are lovingly displayed reminders of very special ladies in my life. Those tower displays are very nice. I don't believe that I've seen them before other than right here in your blog. Must be on the lookout for one. It's wonderful that you know who owned the teacups in their prior lives. Your teacup collection is lovely! Thank you for sharing with us! Beautiful teacups from a group of special ladies! 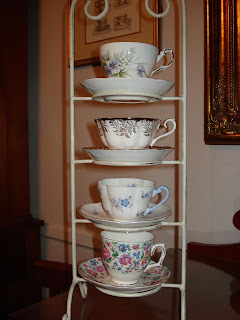 Where did you find the towers for your teacups and saucers? These are the first I've seen and they are delightful!